Preheat the oven to 375°F. Cut the top off the pumpkin. Spoon out the seeds and clean out the inside of the pumpkin. Heat a medium saucepan over medium-high heat and fry the bacon until crispy. Drain all but a tablespoon of the bacon grease and stir in the flour. Add the chicken broth and bring it to a simmer, stirring until thickened to prevent lumps. 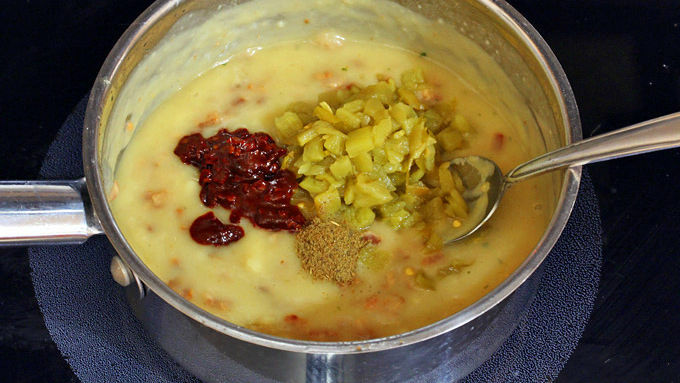 Add the chipotles, diced green chilies and ground cumin to the dip. Add the shredded cheese and stir until melted. 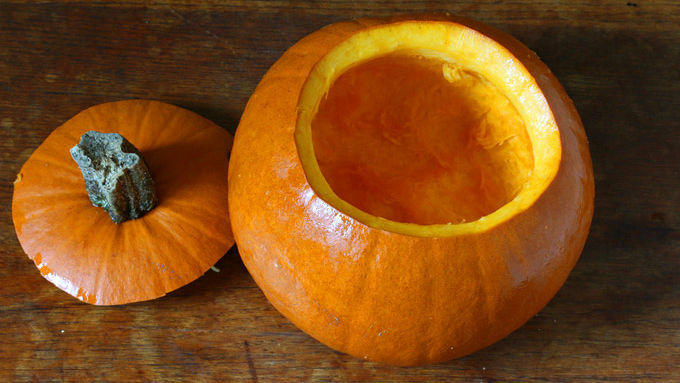 Place the pumpkin in a casserole dish (to catch any leaks). Pour the dip into the pumpkin. Cover the pumpkin loosely with aluminum foil and bake for 50 minutes or until the pumpkin is tender. Remove the foil and continue to bake for another 20 minutes or until the cheese is bubbly and beginning to lightly brown on top. Let cool for 5 minutes before serving. Be very careful when transferring the pumpkin to a serving platter, placing plenty of support on the bottom of the pumpkin so it doesn't collapse. Serve with crusty bread or tortilla chips. Chipotles can be found in the Hispanic section of well-stocked grocery stores, at your local Hispanic grocer, or online. 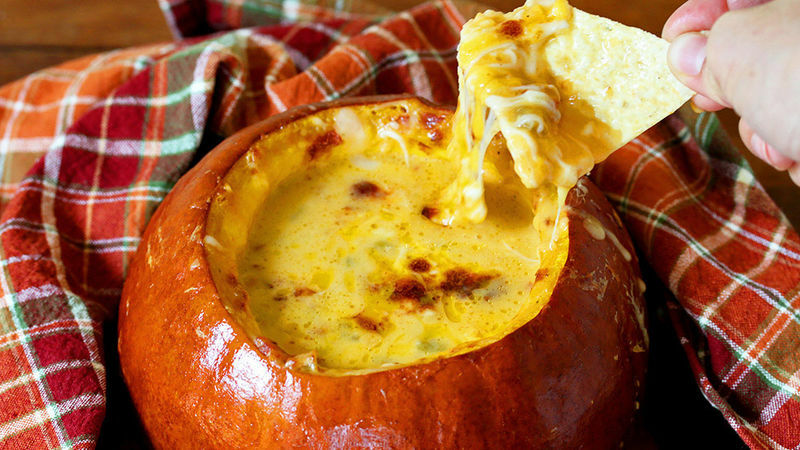 Why use a bowl when you can bake this cheesy bacon dip right in a pumpkin? 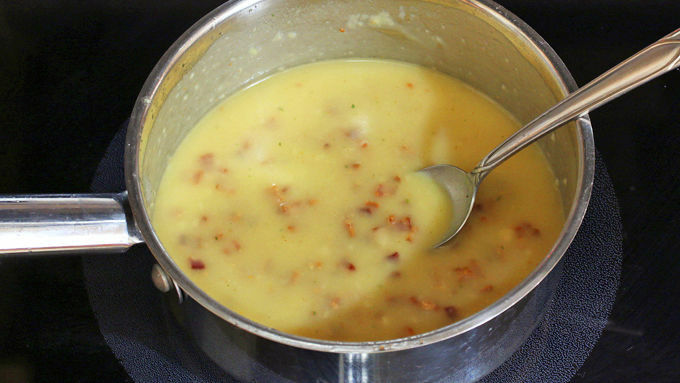 This hot, cheesy, bacon queso is spiced with green chiles and smokey chipotle peppers for a dip with a kick! Part of what makes food enjoyable is presentation. 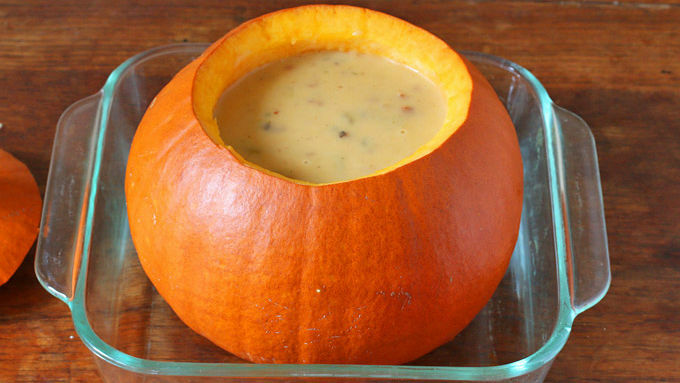 Here's a delicious dip that's served inside of a whole pumpkin – what a fun party appetizer for the holidays! This dip is super cheesy with tons of savory bacon, diced green chiles and some chopped chipotles for a wonderful smoky flavor with a little kick. 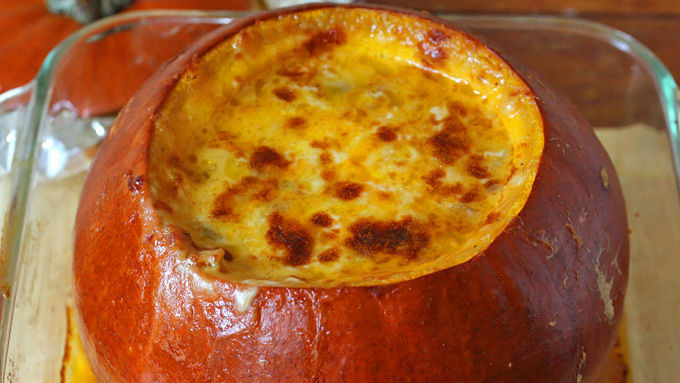 The walls of the pumpkin it's baked inside will keep the dip nice and hot. Chipotle chilis are a key ingredient to add spice and smokiness. Chipotles can be found in the Hispanic section of well-stocked grocery stores, at your local Hispanic grocer, or online. So grab yourself a sugar pumpkin, fill it with this luscious dip, bake and serve at your next party for an appetizer your guests will love!